The California Lottery is minting money. This year, revenues will soar to $6.9 billion. That not only breaks a record, it more than doubles the amount from just a few years before. The California Lottery's revenues now top those at Fortune 500 companies like Clorox, Yum Brands and Harley Davidson. The recent boom has been fueled by a wave of gigantic jackpots. Newer games like Powerball and a $30 scratch ticket offer huge prizes, and California's lottery players have responded by gambling more and more. That should be good news for the state's schools, the lottery's only beneficiary. Yet even as ticket sales have skyrocketed, California schools aren't seeing much of a return on that investment. A KPCC/LAist investigation found contributions to education by the lottery are essentially unchanged from 12 years ago, even though revenues are up by billions. Why? Lawmakers changed the rules governing the lottery in 2010. When California voters approved the lottery in 1984, they required 34 cents of every dollar go towards education. That remained the law until state legislators eliminated the requirement eight years ago. The new mandate for school funding? To "maximize" the dollar amount. Lawmakers made the change to free up the lottery to sweeten jackpots and pump up sales, which had lagged during the Great Recession. The thinking went like this: the percentage of lottery dollars going towards schools would dip, but the extra ticket sales would push the dollar amount higher. These days, just 23 cents of every dollar go towards schools. So despite all the additional revenue, the money for schools has crept up more slowly. The changes have meant that, in the current fiscal year, it took an additional $2.3 billion in ticket sales to reach the same level of support for schools, $1.6 billion, that the lottery provided in FY 2006, adjusting for inflation. Is that increased churn benefitting Californians? "It doesn't surprise me that, as the state has jacked up prizes that purchasing has gone up," said Zahava Stadler of the non-profit EdBuild, which studies education funding. "But the fact that education dollars have remained pretty flat tells you that more and more what the state is doing here is running a casino, rather than funding public schools." The lottery declined our request to interview an official for this story. But in an email, California Lottery spokesman Russ Lopez expressed a different viewpoint. "This strategy has worked," Lopez wrote, referring to tickets with increased jackpots. Lifting the cap on how much the lottery pays out in prizes "has resulted in increased net revenues available to supplement funding for public education." The strategy relies on selling more and more tickets that are, on the whole, money losers for Californians. (Your odds are better in a casino.) And those losses are felt more acutely in certain neighborhoods: KPCC/LAist reviewed store-by-store sales data from the lottery, revealing that those booming sales happen disproportionately in census tracts that are low-income and non-white. Customers stream through the door at LaunderLand on a sunny Monday morning. 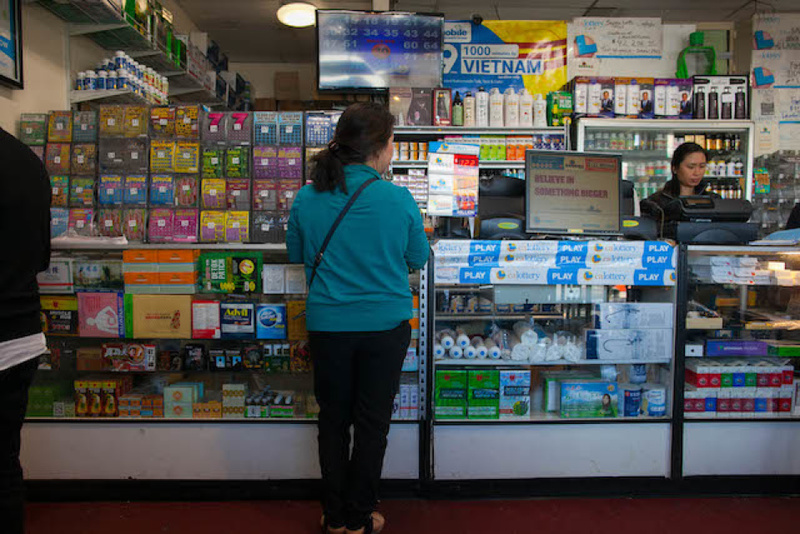 The shop serves Orange County's Little Saigon, and sells a little of everything: SIM cards, Vietnamese newspapers, soda, water, alterations and more — but the biggest draw is gambling. The California Lottery is a cash business, and customers sling ones, tens and even the occasional hundred across the counter at LaunderLand. Some players buy in a steady rhythm, shuttling back and forth between the clerks and the counter as they scratch off tickets. Another group of older men sits outside, keeping an eye on a TV with the latest Hot Spot numbers. That game's draws flash on-screen every four minutes. Other players snap up scratchers from the vending machine in back. One man even roots through a garbage can where players toss out tickets, hoping to find an overlooked jackpot. "The lottery is my main thing," said LaunderLand owner Randy Chung, who keeps an eye on the action from across the store's glass counter. 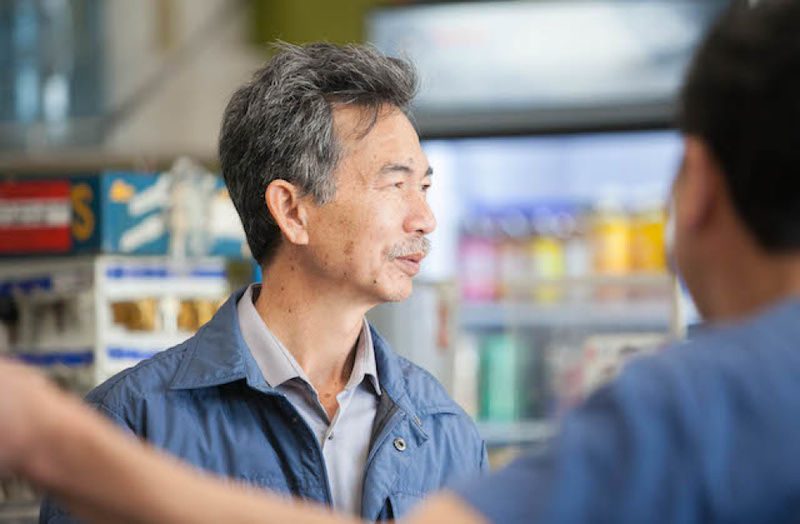 When Chung bought the store 18 years ago, it was a laundromat — you can still wash and dry clothes in the back. He's gradually expanded, but the biggest change came when he got the go-ahead to sell lottery tickets in 2010. Chung has watched sales rise ever since. Initially, LaunderLand sold around $40,000 in lottery tickets each month. These days, the store beats that in a week. Retailers like Chung keep around 6 percent of each sale, plus bonuses connected to winning lottery tickets. "This was a much easier thing to sell," said Connie Chung, who helps her father run the store. "I actually sold the very first ticket. And I just remember it was a day of celebration for us." She framed the first dollar spent on the lottery, which remains right behind a display case boasting dozens of varieties of scratchers. "I just didn't know how big of an impact it would have in our lives," Connie Chung said. LaunderLand has grown into one of the state's biggest lottery retailers, with sales of more than $6 million over the past two years. It's not just LaunderLand. Sales at lottery retailers from San Diego to Crescent City are on an upswing. And they will continue climbing if the California Lottery achieves its goal of becoming the largest lottery in the country. The outlook was bleak at the California Lottery in 2010. The agency was underperforming, with per-capita sales lagging far behind states in the Midwest and on the East Coast. Still, voters in 2009 soundly rejected a ballot proposition to "modernize" the lottery by emphasizing jackpots and advertising. Arnold Schwarzenegger, who was governor at the time, was even floating the idea of privatizing the lottery. Then AB 142 arrived. The bill, introduced by Assemblymember Mary Hayashi (D-Hayward), promised to goose lottery sales by loosening rules around jackpots. Her measure proposed allowing more than 50 percent of revenues to go towards prizes for the first time. To free up a bigger share of the pie for jackpots, the bill eliminated the requirement that 34 percent of revenues flow to public education. Instead, the lottery simply had to balance revenues and prize payouts at a level "that maximizes the total net revenues allocated to the benefit of public education." One supporter of the changes was GTECH, the gambling conglomerate that contracts with the California Lottery, providing the equipment and infrastructure that allows the lottery to run smoothly. GTECH spent half a million dollars lobbying around AB 142 in 2010. The company had a backup plan in case legislators sat on the proposal: it dumped another $2.8 million into an effort to create a ballot proposition with similar language to AB 142. That wasn't necessary. With the support of GTECH, the grocers association and education groups, AB 142 sailed through the statehouse. Only one legislator voted against the bill, which was signed into law by Schwarzenegger in April 2010. The impact was immediate. GTECH's parent company noted in its annual report that "our efforts to reform prize payouts in California supported sales in the last few months of 2010." The lottery finally had the flexibility to introduce high-dollar games. California joined the multi-state Powerball game in 2013 and also unleashed a wave of extra-large, extra-expensive scratchers. The pricier scratchers, especially the $20 and $30 tickets, have slim margins: The sale of a $30 scratcher nets considerably less for the agency than $30 spent on $1 scratchers. Since 2010 — as the law's backers predicted — revenues have climbed, and the lottery has directed a larger and larger slice of the pie towards prizes. This fiscal year, sales are projected to hit $6.9 billion. Schools will see $1.6 billion of that. In 2010, sales were $3 billion and the contribution to education was $1.1 billion. "By God, it is making money," said Bill Hertoghe, a former director of security of the California Lottery who still consults with the agency. Hertoghe said when he worked at the lottery he rarely heard talk about the share of money for education, summing up the California Lottery's priorities as "Sales: priority number one. Number two: sales. Number three: sales." He said the changes since AB 142 show the lottery's sales prowess, but paint a complicated picture. "We're selling more, more money's going to the player, and about as much is going to education. And that was never the intent," Hertoghe said. Those who watch lotteries say they're under constant pressure to introduce flashier products and ever-larger jackpots, just to keep players coming back. And as California has done just that, it's managed to buck a nationwide trend of stagnant sales. "At least in California you're still increasing," said Richard McGown, an economist at Boston College. "Now it doesn't sound like it's increasing enough to make a difference in education funding, and so that's a problem." Former Republican Assemblymember Chuck DeVore was the lone no vote on AB 142 back in 2010. He compares government-sanctioned gambling to encouraging Californians to smoke more cigarettes, because that generates tax revenue for the state. "That's your government telling you to go out and gamble! And for me, that's an unhealthful message," he said. He hasn't been following the situation in California closely, so upon hearing that sales are booming as dollars for education remain relatively steady, DeVore — who now works at a Texas free-market think tank — chuckled. "They're getting the worst of both worlds," he said. Who wins? DeVore said it's the retailers — the gas stations, liquor stores and markets that sell tickets. The lottery also comes out ahead. And so do contractors like GTECH. Last year, the lottery extended its contract with GTECH (now known as IGT) for another seven years, at a cost of as much as $800 million. The lottery estimates over 19 million people played its games last year — more than half the state's gambling-age population. Louis Nguyen is one of the 19 million. He's lived in Westminster for 29 years, and has been playing the lottery for the last dozen. Nguyen stops by LaunderLand most mornings to pick up a few tickets. "Every day I'm [buying] Fantasy 5, sometimes Super Lotto and Powerball," he said. A sign out front announces a jackpot of $143 million for Mega Millions. That's not a record for the game, not even close, but it's drawn Nguyen to the store today. He researches the games, and he knows the odds are long. Asked about his chances, he flips over a Powerball ticket to point out the odds of one in 293 million for the top prize (the odds for Mega Millions are even longer). Still, Nguyen said he's come close to winning jackpots twice. "So far I haven't met my luck yet," he said through a translator. Westminster, where LaunderLand is located, sells more lottery tickets on a per-capita basis than any other California city with over 50,000 people. Lottery sales in the city were $668 per resident per year, in 2016 and 2017. Neighboring Garden Grove boasts the fourth-highest per-capita lottery sales in the state. There, sales were more than $426 per person per year. None of that surprised Nguyen. He said he and many of his neighbors live in modest apartments and mobile homes. "We have meager income," he said. "And so with this kind of opportunity we may be able to change our lives." Nguyen, who retired after working in printing, said he hopes to improve the situation of his family. If he ever does hit the jackpot, he plans to send money to care for wounded veterans in Vietnam. The California Lottery believes surging sales are due to existing players spending more each time they play. For Louis Nguyen, that difference comes down to spending three or five dollars on draw games. For Anthony Wu, the dollar amounts are higher. A few minutes after Nguyen left, Wu was buying five tickets at LaunderLand. "Everybody knows this is a lucky store. I buy a lot of places and never win," he said. "I win a lot here." When jackpots swell, Wu drops as much as $200 on lottery tickets. A more typical week comes to about $70. He estimates he's lost more than he's won on the lottery since he started playing in the 1980s, but he's undeterred. "You don't win back. But you hope one day ... God calls you, then you get it." Not everyone at the store comes to gamble. Sitting next to a stand where lottery players pick their numbers, Diu Trong Pham is at LaunderLand for a SIM card. He doesn't play the lottery, but said most of his elderly friends do. "They're lonely, they don't have anything to do," he said through a translator. He worries some of those close to him may have become problem gamblers. "It's a game between hope and, you know, failure." A cluster of stores in Orange County, all in Westminster and Garden Grove, were among the lottery's 30 biggest retailers in 2016 and 2017. The six stores — Gallop Liquor, Café Trang, Coffee Lovers, Al's Market, LaunderLand and Café Deng — together sold $53.3 million in lottery tickets. The retailers all sit in census tracts that are home to a plurality of Asian-Americans, and are among the bottom group of incomes in the county. Ticket sales are disproportionately high in the poorest quarter of census tracts in nearly every populous county. Ticket sales are disproportionately high in Southern California census tracts with a plurality of Asian-Americans or Latinos. Ticket sales are disproportionately high in the Southern California counties of Los Angeles, Orange, Riverside, San Bernardino and Ventura. The findings did not surprise Dr. Timothy Fong, director of UCLA's gambling studies program. "The lottery does seem to be more harmful for, as you can imagine, lower economic communities, ethnic minorities," he said. Lottery and census data show that, while about 7 percent of people in Southern California live in an Asian plurality census tract, over 10 percent of lottery sales took place there. Sales were also high in tracts with Latino pluralities, and low in areas where whites are the most common racial and ethnic group. The lottery acknowledged that Southern California is home to some of the highest per-capita sales in the state. Lottery officials did not respond to our findings about the demographics of lottery sales. Lottery sales data reveals the demographics of areas where the lottery is sold; data of sales by ethnicity and income of the individual lottery players are not tracked. "That community in Westminster and Garden Grove, it's working class, it's folks who are first- and second-generation immigrants who are really hoping for a better life," Fong said. Reports by state government and community health groups have both observed high rates of gambling among Asian-Americans in California. For some Asian cultures, high rates of gambling may be linked to social and cultural factors that are centuries-old. The lottery also takes care to market to California's diverse communities. In 2015 it inked a marketing contract with the firm Time Advertising, worth as much as $21 million dollars over five years, to reach Asian-Americans. That work goes into overdrive for products like its Lunar New Year ticket. Lottery advertising for the 2018 Lunar New Year scratcher in Chinese. Advertising materials were also created in English and Vietnamese. The $1 ticket promises a jackpot of up to $888 (eight is a lucky number in Chinese culture, associated with wealth). Ads for the ticket ran in Chinese, Vietnamese and English. Vietnamese celebrate the holiday as Tết, and the tickets are a hot item at LaunderLand. "Every New Year's there's a little tradition where adults would give children, the younger generation, lottery tickets," Connie Chung said. UCLA's Fong said that advertising feeds into cultural traditions. 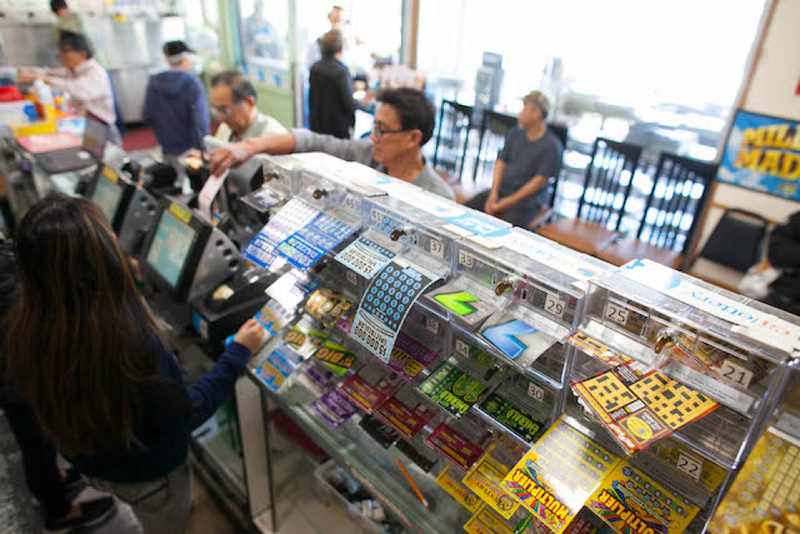 "When you market aggressively toward that community by having these scratchers that have the dragon or celebrate Chinese New Year, then you will have disproportionate sales for the lottery," he said. The marketing to Asians represents just a small piece of the California Lottery's advertising budget. The contracts active in 2017 represent as much as $560 million in expenses over their lifetimes. They also include agencies that specialize in marketing towards Latinos and African-Americans, though the largest contract is for the general market. 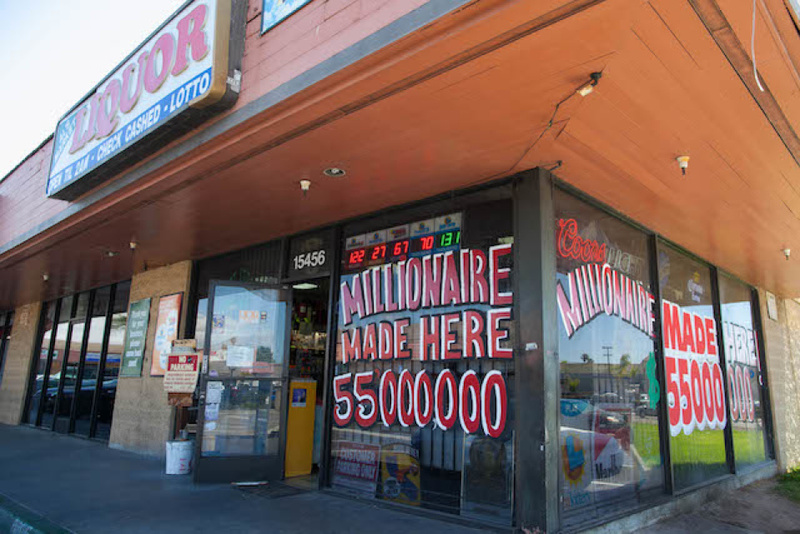 "A SYSTEM THAT TARGETS THE POOR"
Our analysis found that nearly every inch of land in some of Southern California's smaller cities is within half a mile of a lottery retailer. That's the case in places like San Fernando, South El Monte, Alhambra, Inglewood and elsewhere. Many of those cities generate elevated lottery sales, compared with the rest of the state. Our analysis also found that per-capita lottery sales were higher across Southern California than elsewhere. Per-capita sales across the five Southern California counties were $205 per year in 2016 and 2017, more than $50 higher than the rest of the state. One thing that remained consistent — sales were higher in the poorest quarter of census tracts. That was true nearly everywhere — in 43 of the state's 45 counties with at least 10 census tracts. Westminster and Garden Grove boast several of the state's top lottery retailers. Al's Market, a liquor store in Westminster, is among them, having sold more than $6 million in lottery tickets in recent years. Across the state, a third of lottery sales happen in the poorest quarter of census tracts for median household income. Meanwhile, the richest quarter of tracts account for just 15 percent. Advocates say having poor neighborhoods foot the bill for education funding is unfair. "What that means is you're transferring a larger share of the cost of public education to those who are least able to afford to pay it," said Jonathan Kaplan of the California Budget and Policy Center. Critics of the lottery said it's no accident that the divide in ticket sales is wide between affluent and poor areas. "It's very clear that this is a system that targets the poor," said Zahava Stadler of EdBuild. An analysis her group did in 2016 of California Lottery sales found few lottery retailers in upper-income areas — while many low-income neighborhoods have plentiful opportunities to snap up a lottery ticket. "The California Lottery's mission is to maximize supplemental funding for our state's public schools. I mean, that is in the mission statement," said Stadler. "And yet it pulls money out of poor communities for a very tiny amount of supplemental education funding." For all the effort — the record sales at more than 20,000 retailers across the state — the lottery's contribution to education makes up a negligible portion of education funding. That was true before AB 142's changes, and it's true today. "It's toilet paper money," said Mona Field, who writes a textbook on government and served on the Los Angeles Community College District board for four terms. "It really has always been a tiny, tiny percent of our education funding in California." The biggest chunk of lottery education funding goes to K-12, what amounts to about 20 cents per every dollar spent on the lottery. That funding, which can top a billion dollars, is a small trickle in the giant pool of education funding — around 1 percent of total K-12 funds, according to the California Department of Education. On its own, lottery money "cannot provide for major improvements in K-12 education," the California Department of Education states on its website. Higher education and specialized schools get a smaller chunk of lottery dollars than K-12. In his statement to KPCC/LAist, Lottery spokesman Russ Lopez wrote, "the Lottery has had a strong, yet limited impact on public education." For Jonathan Kaplan, perhaps the biggest misunderstanding about California's lottery comes down to the false impression people have about its role in funding our schools. "Oftentimes people will say, 'So you have problems with K-12 school funding? What about the lottery?'" he said. "Well, the lottery doesn't provide very much to K-12 schools." Editor's note: A version of this story aired on KPCC in two parts. The first part can be found here, and the second part is here.